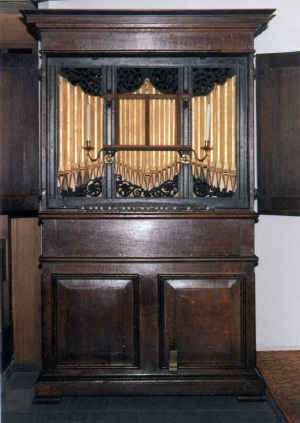 The history of the organ is unknown further back than ca 1924. There was evidently some work undertaken in the early 1840s, when a new roof was sealed with newspaper. The alteration to the keys is 18th century. Further alterations dated from 1924. This is a late 17th century English consort organ. A number survive in good condition. This is likely to be a late one, perhaps as late as 1700, partly because it has a two-rank treble mixture. It is anonymous, and likely to remain so, but the inked note marks in German/Dutch style on the inside of the bar-frame shows that the maker is likely to have been an immigrant, and perhaps with a connection to Bernard Smith’s workshop. The pitch is a¹=452 at 20ºC. The keys and pipes show that the pitch was lowered by two semitones, presumably in the 18th century. The pipes have since been moved about and cut down, but also fitted with tuning flaps. An original pitch between one and two semitones sharp seems likely. The tuning is now one fifth comma meantone. Although there is no way of knowing from the organ what the original tuning was, this tuning did fit the available pipes, with one or two at the extreme edge of their tuning possibility. The compass was originally C AA D to c³. In the 18th century the pitch was lowered two semitones by moving the keys for C and AA to make c#³ and d³. The move is still apparent in the patching needed. The compass is now D to d³. The treble stop used to start at c#¹, now d#¹.